Fabulous Four Yard Veils is designed to help belly dancers of all levels confidently wield a veil of any length with finesse, style, grace and artistry. Fabulous Four Yard Veils is designed to help belly dancers of all levels confidently wield a veil of any length with finesse, style, grace and artistry. 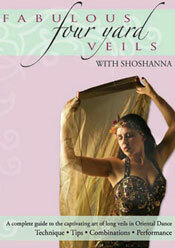 Shoshanna is a captivating master of the veil whose performances have sparked an interest in veils for many dancers. She has taught her unique style of veil work across the country and is delighted to have a chance to present this compendium of veil knowledge in one marvelous DVD. 90 Minutes.